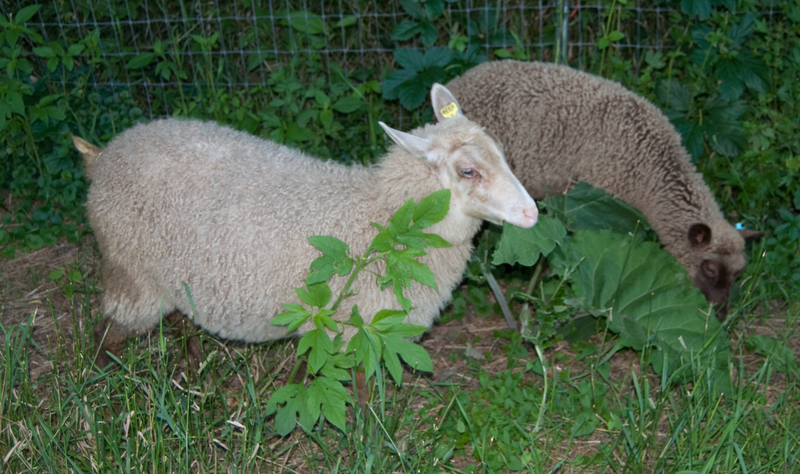 Our new Finnsheep ram lamb is from Gail VonBargen of Little Red Oak Farm. His mother is black piebald (wildly spotted) and sire is brown. So he BBBb with spots. 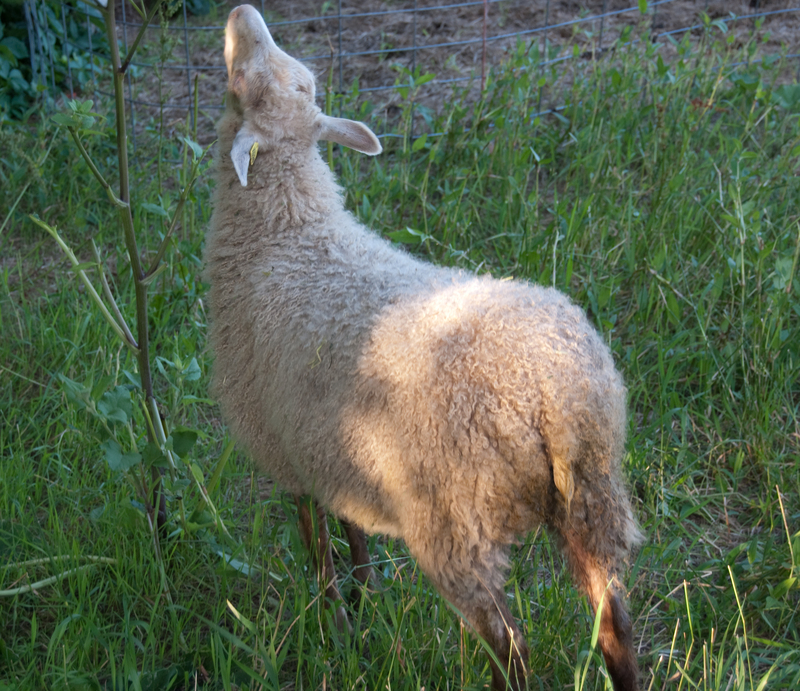 Or so we thought… Last Saturday, as Knuut was being sheared, his fiber fell aside to reveal a beautiful silver grey. Finnsheep genetics are not as well understood as Shetland genetics, but Shetland breeders would call this type of change “modified.” I think it is beautiful, whatever it is called. On Sunday, daughter-in-law Ashley helped me skirt 21 fleeces. This is our first year shearing in autumn. We will always shear twice annually from now on! 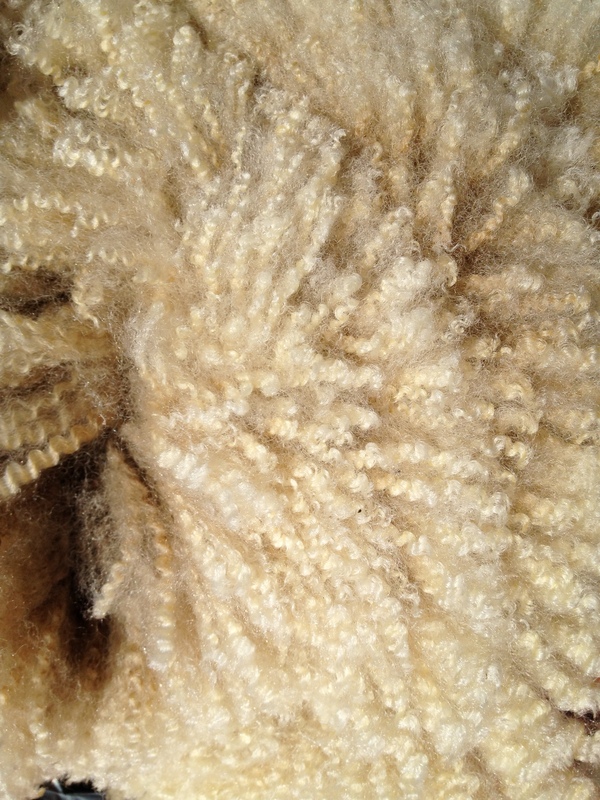 The fleeces were very clean and the six-month old lamb fleeces are luscious! 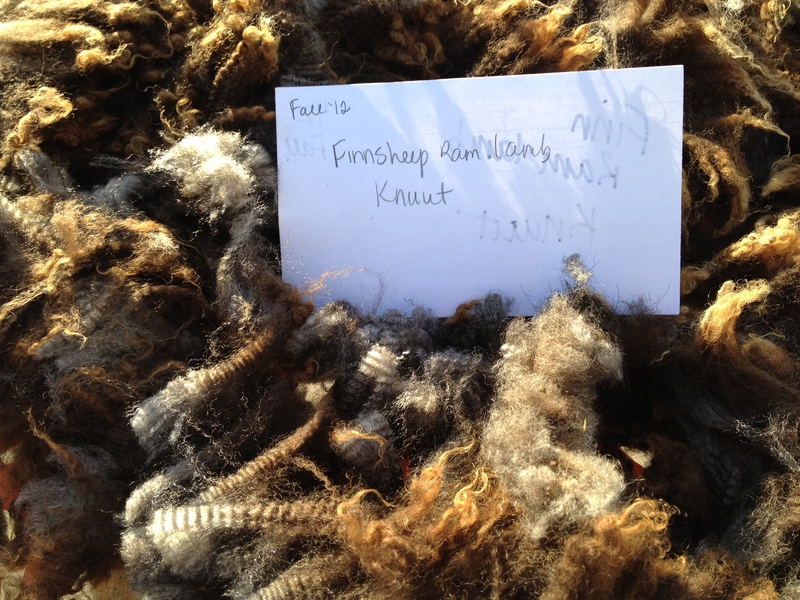 I am working on a Roundaboutacres Sales blog and will get photos and prices of sale fleeces online in the next few days. In the meantime, here a few photos. I have not maintained a weekly post this year. 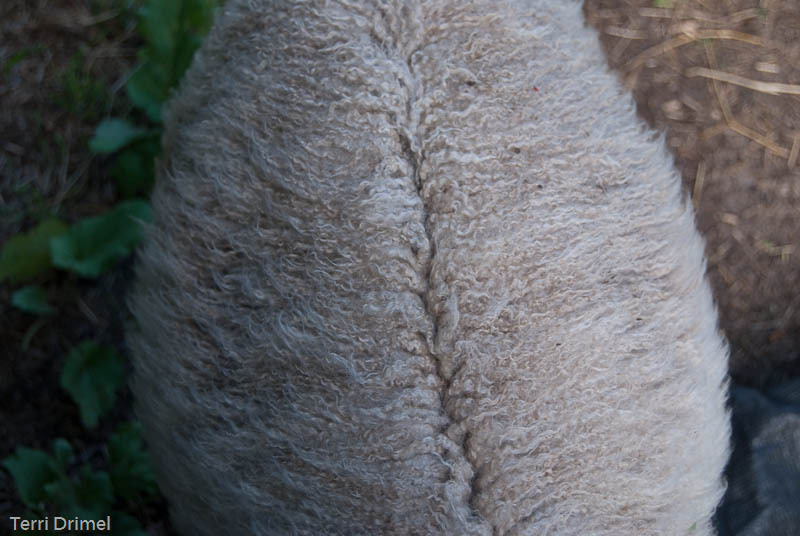 I lost my motivation to blog when we made the decision to trim the flock. 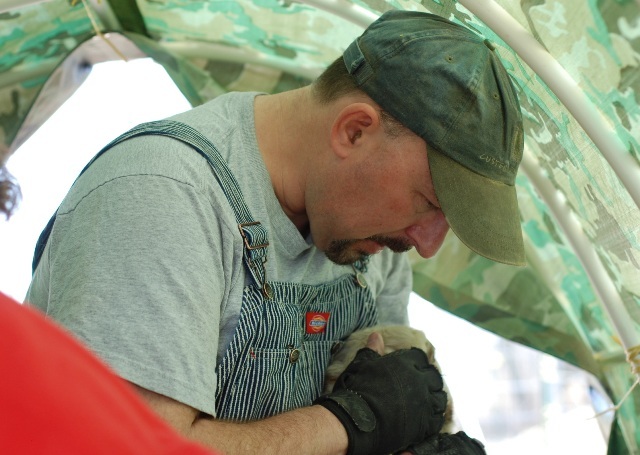 I am sad, but resolved that we DO need to trim the flock because my lungs do not like the hay. This spring we planted more apple trees, raspberries, blueberries and 70 grapevines in our newly established vineyard. We are moving our focus to fruit and berries; next year we will likely add many more grapevines. Trophy Husband made the commitment to keep four llamas and a small handful of sheep. We really appreciate and enjoy the zen vibe of llamas. If you have llamas, you know what I mean. 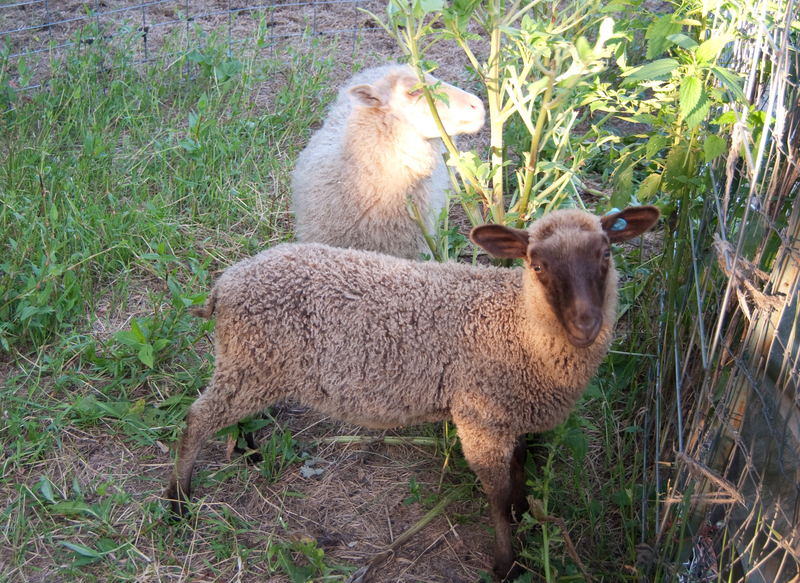 We are keeping four sheep, Emmi (a black Finn ewe,) Reese’s Pieces (brown 1/2 Shetland, 1/2 Finn ewe lamb,) Jellybean (musket Shetland ewe,) and Phyllis (white Shetland ewe.) We may keep Reese’s Pieces twin brother who is also brown. The sheep that are left in the flock have remained because I liked their fiber and personalities. But, we can’t keep all of them! Make an offer, sheep that aren’t sold will have to go to the freezer this fall. 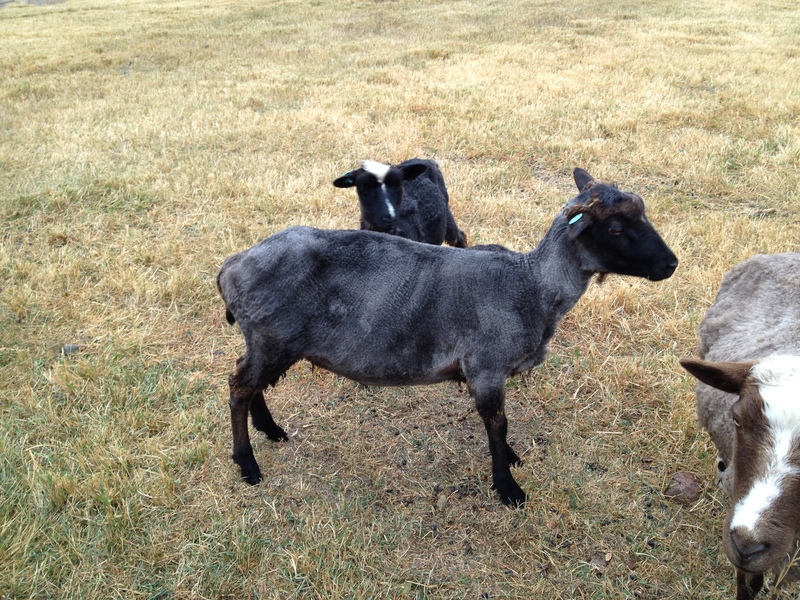 Kia one year old Finnsheep ewe, she is dark gray, carries spots. Her fiber is lovely- she is gray at the skin, not a fading black. She had a single piebald lamb this year. 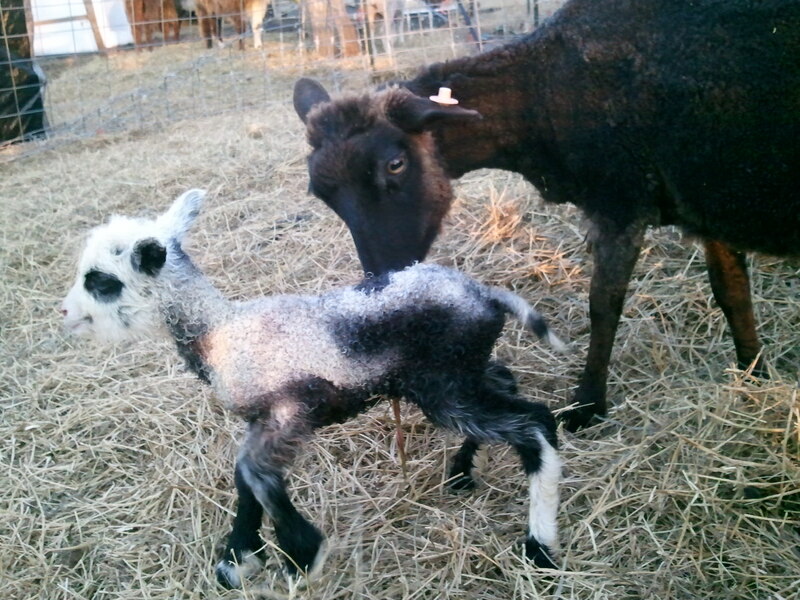 She is shown in the photo below with her spotted, piebald ram lamb. $200 + registration fee, if desired. SOLD 2011 Single Finnsheep ram lamb. 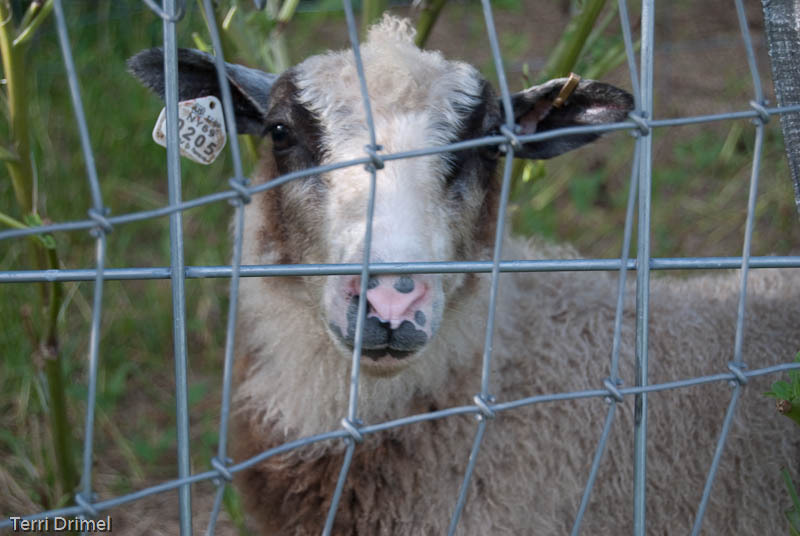 He is a gray, piebald ram lamb. Shetland Bonnie in full fleece. Born in 2009, she is moorit and carries spots. She will be for sale after her lambs are weaned. Brown twin ram lamb, 1/2 Shetland (Bonnie) and 1/2 Finn (LRO Eino) – he is still intact and would make an excellent sire for a fiber flock. His fiber is very soft and plentiful. I am still deciding if I should whether and keep him in the spinner’s flock. Brown is my favorite color to spin. $150 He is shown in the photo below with Bonnie, his Shetland dam. He is solid brown, carries spots. 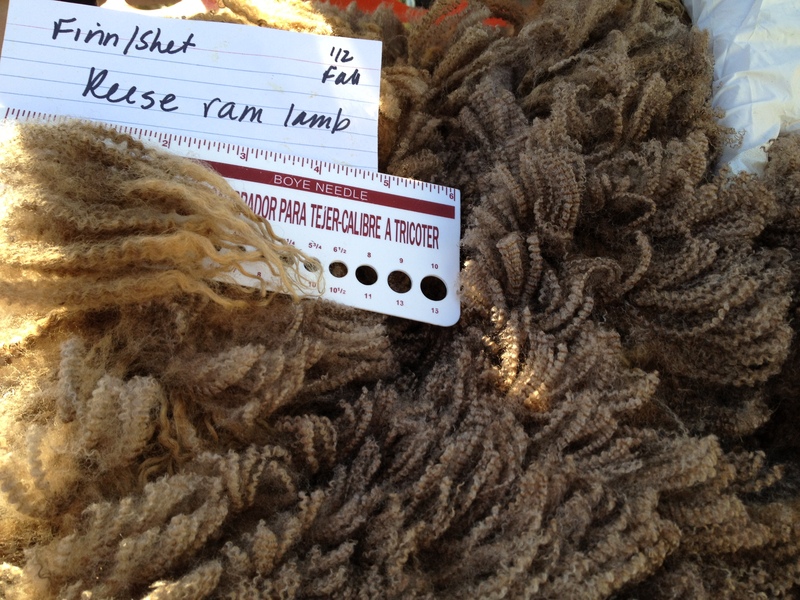 Finnsheep ram lamb – Twin, black, carries brown and spots, nice fiber, good growth. $200 plus registration fee, if desired. 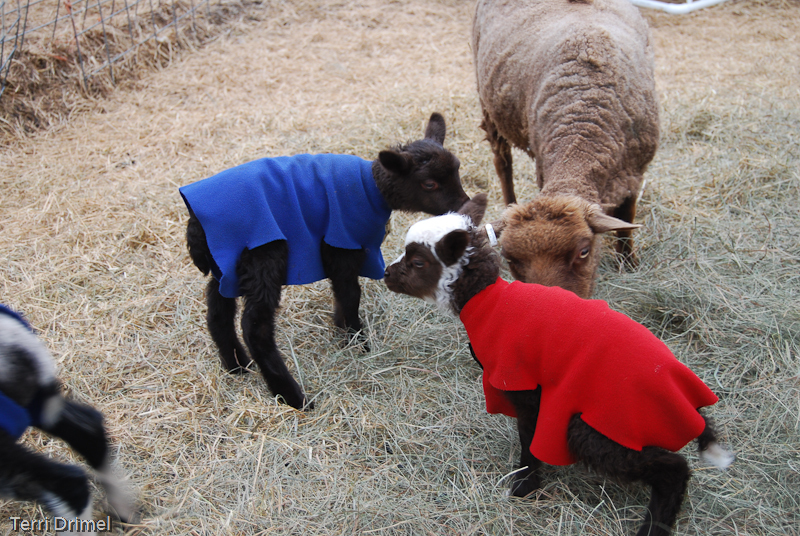 Glory – a small gray Shetland ewe, and Curly – a non-fading black Shetland whether, both are spoken for. While preparing this post, I realized I need to take some updated photos of the flock. If you are interested in a sheep and would like more photos, just leave a message. I will take more photos in the next few days and post. It’s jail for our Bad Boys! I guess I should say they are just doing what nature intended… My plan was to remove the ram lambs in a few more weeks but a few of our ram lambs have different ideas. The new Finn ram lamb was lovin’ up every ewe in the barnyard. They just ran away from him but I don’t want to take any chances. 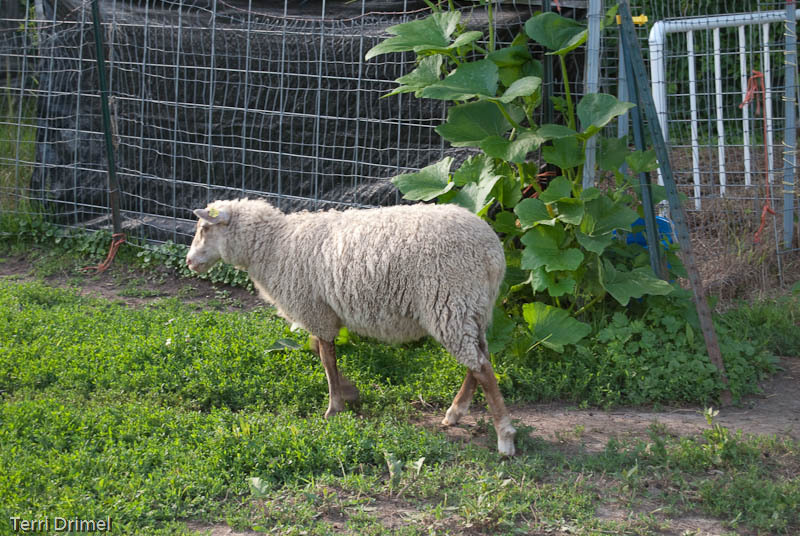 So I put him in a pen with BFL – NC Cheviot cross Tank who was also friendly with the girls. I will get them set up on their own pasture. I have decided to name our new ram Toivo, which means “hope.” I have big dreams for this Finn ram so the name is fitting. Also, coming from northern Minnesota and being Finnish myself, I grew up with the name – even if it was used a lot in jokes! 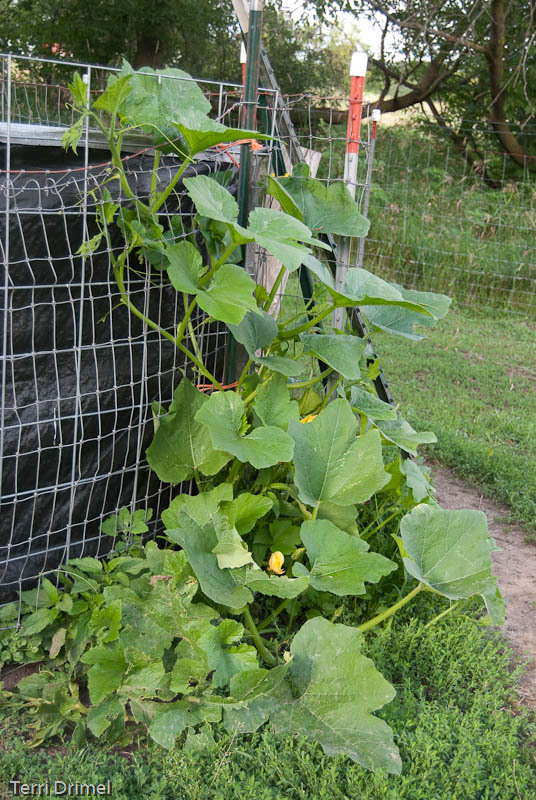 While The Shepherdess (Cop) was throwing the boys in the brink, I noticed this pumpkin plant growing along the fence line. I wonder how long the sheep will let this grow? It must have planted itself from a pumpkin I fed the sheep last winter! 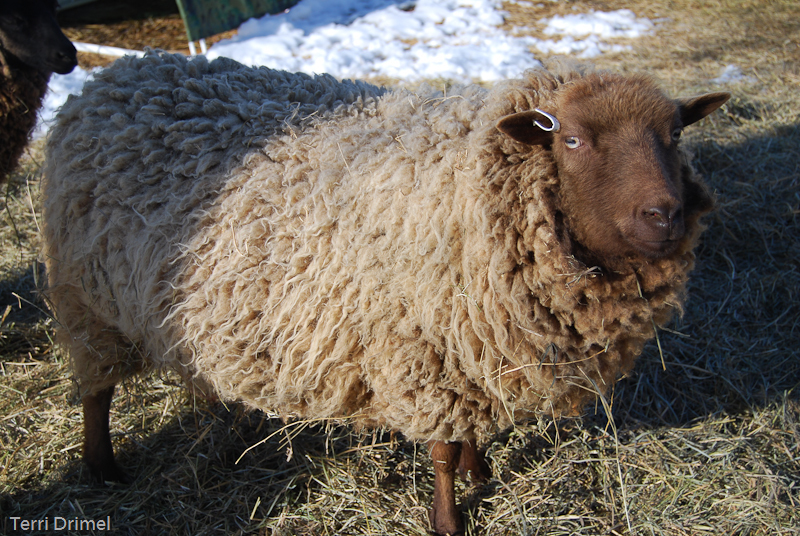 This photo is of our newest Finn ewe lamb from Gale Woods Farm. I have decided to call her Saara. 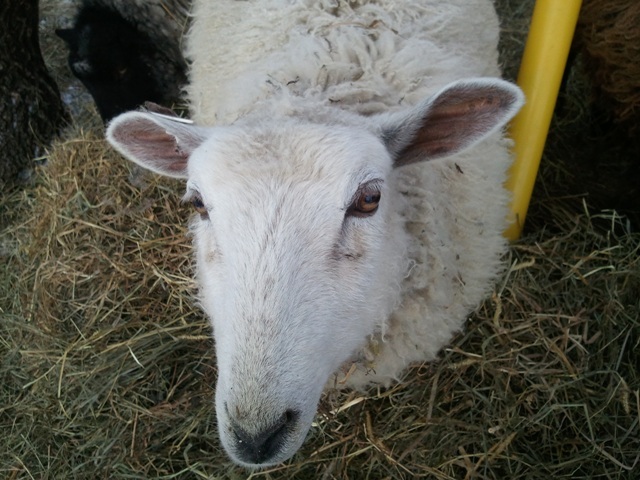 She is a calm, friendly, very feminine lamb who is white with light brownish gray legs and white boots on her rear legs. She is a twin but her sibling died at birth; consequently, she got all the milk so she is a very good size – she must weigh at least 50 lbs. I need to get a larger sling to weigh the lambs as they get larger. Saara’s fleece is white to the roots. Her legs are both brown and gray; she has brown and black in her background so time will tell what her base genetics are. 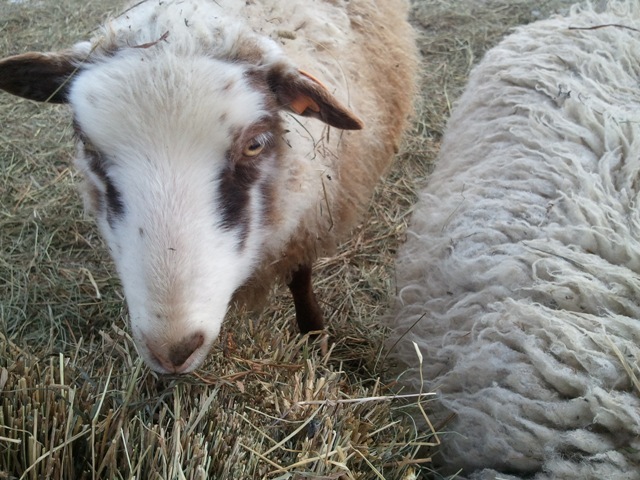 I love wool even though I am sensitive to the “itch” factor. I have learned to love the smell of lanolin when washing fleece. My hands like that soft feeling of the grease in the water when a fleece is soaking. 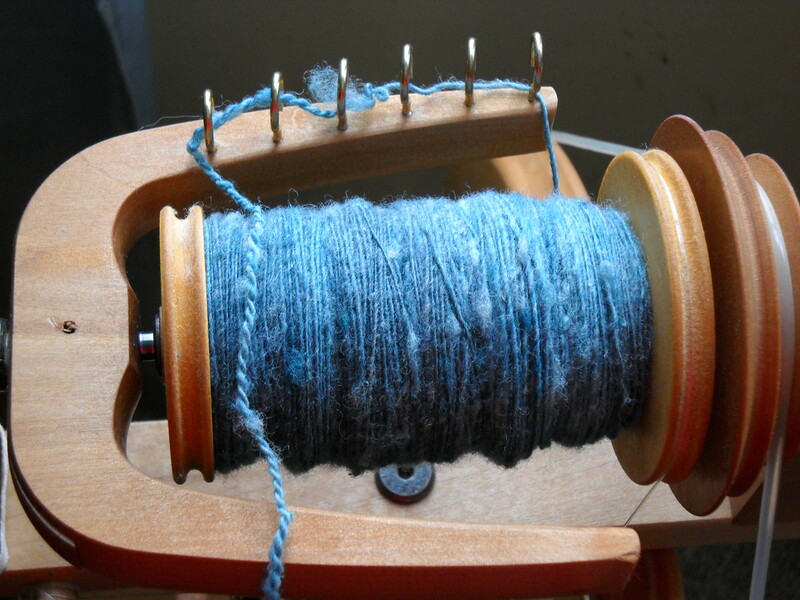 And picking, carding, spinning, plying, weaving or knitting are lovely tactile pleasures. Having said that, I have happy for a lightweight, rip-stop nylon tent that sheds water when camping in a rainstorm. Also, a breathable rain jacket is a vast improvement over the inexpensive plastic raincoats that leave me more drenched in sweat than rain! And thankfully, our police officers and troops are protected daily by Kevlar vests which will stop a bullet. Having said that, if set on fire, wool will self-extinguish; synthetic fibers will melt onto one’s skin. So there is a place and use for synthetic fibers. But production of any fiber comes at a cost to the environment. Scouring natural fiber involves water, soap/detergent and vinegar. With synthetic fibers, I never really thought about the oil and chemicals involved in the manufacturing process. Thank you again to the ladies of O Ecotextiles for their excellent information!